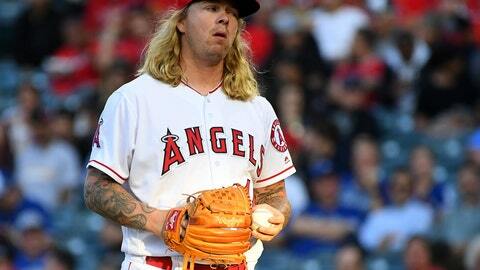 Well, hit the replay button: the Angels have placed another pitcher on the disabled list. Lefty John Lamb exited his Tuesday start in Boston after just 1 2/3 innings and the Halos placed him on the 10-day DL with left shoulder and elbow inflammation Wednesday. Lamb, who has started three games for the Angels since being called up June 16, has only made it through the fourth inning once and is carrying a 7.20 ERA in his 10 innings pitched. Deck McGuire is starting on Sunday for the #Angels. The southpaw joins fellow pitchers Garrett Richards, Jim Johnson, Nick Tropeano, Blake Wood, Shohei Ohtani, Keynan Middleton, Matt Shoemaker, J.C. Ramirez and Alex Meyer as the 10th Angel currently on the disabled list. In response to Lamb’s injury, as well as optioning reliever Akeel Morris, the Halos have recalled reliever Jake Jewell and infielder Nolan Fontana from AAA Salt Lake.